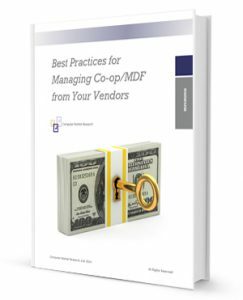 Successfully managing Coop MDF money from multiple vendors is no easy task. That’s why we’ve created this white paper to help you get the most from your vendors’ Co-op/MDF programs. Having greater access to funds can lead to more effective marketing campaigns and ultimately, more sales. To have our free white paper sent to you, “Best Practices for Managing Coop MDF from Your Vendors”, simply fill out the requested information to the right.